Is there anything more strangely alluring in a window than beautiful, bookish women captured for a moment for all to admire? 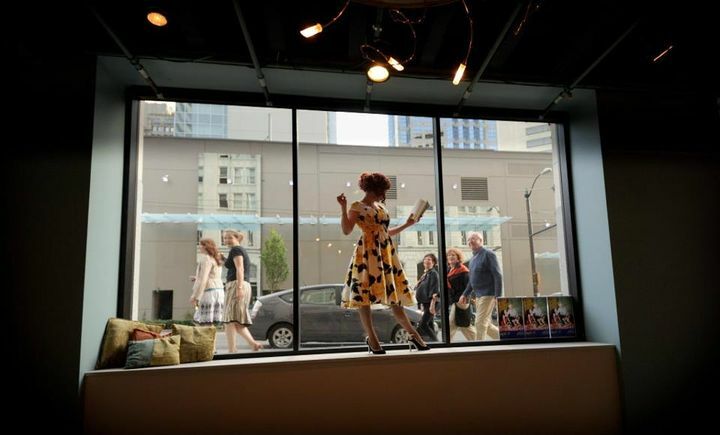 Live pinup models posed in ACT Theatre’s 7th Ave window last weekend to warm up passersby for the three night engagement of the Beebo Brinker Pulp Cabarets at ACT Theatre’s Central Heating Lab. The best of the ongoing Re-bar series based on the iconic lesbian pulp novels of Ann Bannon kicked off last night to an adoring crowd and will run again August 26 and 27, with a special meet and greet with the author herself on Saturday from 5-6pm. The ongoing Beebo Brinker Chronicles Festival has been an extremely rewarding experience for those in the cast and crew- and there are more Seattle burlesque luminaries involved than you can shake a feather boa at. I was so thrilled when the Beebo Brinker production team contacted me to perform in their ACT cabaret, and furthermore, to act as their choreographer. We rehearsed late into the evening, and I do believe that the explosion of pink we are creating will be an absurdly charming way to open the show. As for myself, I look forward to making a very, very good friend of Rhonda J Soikowski (Beebo Brinker). If you would like to find out what I mean by that, you will just have to come to one of the shows. Thurs – Fri at 7:30 p.m. and Sat. 7:30 & 10:00 p.m.
Bullitt Cabaret at ACT, 700 Union St.
Beebo Brinker ACT's poster (Photo by POC). The Atomic Bombshells, one night only at the Moore. ~ by angrytruffle on 08/26/2011.